Nestlé knows the importance of having a good custom display rack. But, they’ve jacked up the usual POS display into something bigger and better. 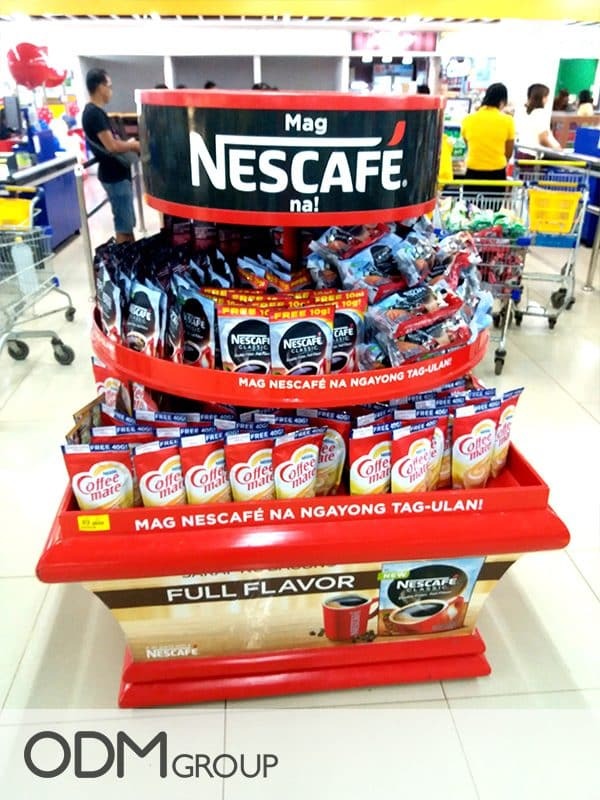 They utilized this attention-grabbing Free Standing display unit in the Philippines recently. POS displays, or point of sale display units, are like the Kardashians of the marketing world. They can be customized to what’s hot and can even set a trend. However, if not executed properly, they could bring in negative publicity. Whether you hate or love them, they definitely know how to grab everyone’s attention. This is what every marketing campaign needs to promote their brands and products effectively. In the next few items, we’ll give you the best-kept trade secrets to effectively create the best Free Standing POS display unit. But first, we need to discuss Nestlé’s Custom Display Rack. Nestlé’s display unit is unique. Uniqueness is vital since the primary goal is to catch the attention of the customers. We need to drive them to the display unit and to the products. The logo placement is accurate. It’s highly visible even from afar. The big font size contributes positively to the whole unit. Product placement is superb! 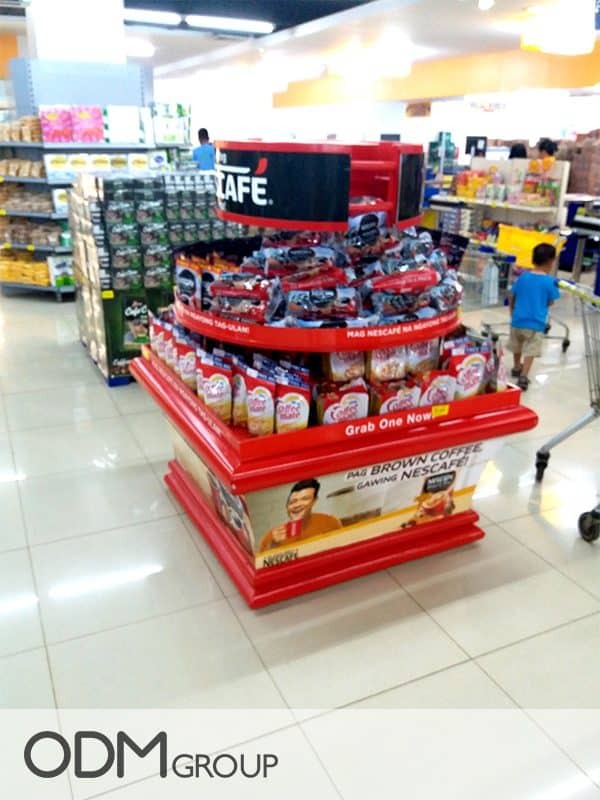 The Nescafe coffee, which is their flagship product, is near the eye-level, making it easier for customers to see and have access to the products with ease. Tips on how to properly create a good Custom Display Rack. Play with colours – Colours greatly influence the way your product is perceived. It plays a major role in luring your customers into your products. We highly suggest utilising bold and eccentric tones. But, if the other displays are already using one, don’t hesitate to deviate to a much darker palette. This creates a contrast that helps your display unit stand out. Make an interactive display unit – Having an interactive display enables the shopper to touch, feel, and experience the product. This actually drives customer engagement. See this interesting POS counter display from Goodbye Kibami below. Use Graphics – If we talk about capturing customers’ attention, bold graphics are on top of the list. We all know that everyone is in a hurry, busy, or distracted. Displays need to capture their attention in a matter of seconds. Furthermore, using video POS display is also highly recommended. Strategic Location – Since these are free standing displays, it is paramount to place these units on strategic, high foot traffic locations. This is evident in Nestlé’s POS Display unit that we are discussing. Overall, we can say that the open design, bold colours, and strategic location made their free standing display effective. Brands are competing with each other; creating various marketing strategies to win customers. But you can never go wrong with a well-designed Custom Display Rack. If you love this Custom Display Rack, feel free to contact us anytime. ODM has the right people and resources to deliver the marketing items you need. Check out Clarins UK eye-catching POS display and their glittery Christmas promotional pouch bag. This display unit is both innovative and appealing whilst directly relating to the Chinese tradition.